In the SAFER project five organisations (Regierungspräsidium Stuttgart-Germany, Dublin City Council-Ireland, Forestry Commission Scotland, Federal Office for Water and Geology Biel-Switserland and Ecole Polytechnique Fédérale de Lausanne-Switserland) cooperate. Their objective is to develop innovative strategies and develop and mitigate fluvial and coastal flood damage (SAFER, 2008). The first element in the project is to develop flood hazard maps, which show the extent of different flood events as well as the depth of water. Based on the maps precautionary measures and flood management can be developed. The example of the Neckar catchment area (Zeisler, 2005) shows two maps for the expected depth and the spatial impacts of a flood (Fig. 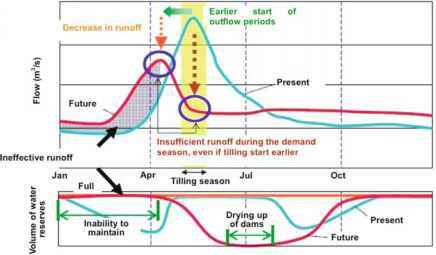 4.7) and the influence on different functions along the river in cross section (Fig. 4.8). The second focus in the SAFER project lies on the creation of partnerships. It aims to create a direct link between the flood protection measures and the people who might be affected by flooding. The partnerships function as a platform to discuss flood protection, raise awareness and exchange of knowledge. The third component in the project is the development of flood emergency management systems. The enhancement of the internet-based flood information and decision support system includes an early warning system, support emergency services, the alarm system and community action plans. The warnings are divided in three categories: long-term, astronomical spring tides (a year in advance), medium-term, sea surges (10 days in advance) and short-term, any tide (24/36 h in advance). The chance at a flood times the effect of the flood determines the risk. In the Netherlands, the protection against water from outside has been in order for centuries and therefore many people think they are living at a safe place. This is why continuously new investments are done in the area behind the dike. Because of that, the potential effect of a flood increases. If the risk needs to be decreased solutions at both ends of the risk formula can be found. 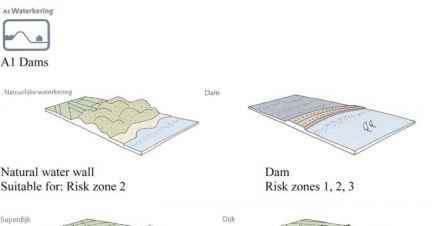 In the first place, flood risk can be decreased if the dikes are strengthened. But the safety cannot be guaranteed for the full 100%. And this becomes even more difficult if the pressure on the dikes increases due to sea level rise and the peak discharge in rivers increases as well. This is why measures to minimise the effects of floods need to be taken as well and become increasingly important. Spatial adjustments are necessary to minimise the effects. By decreasing the chance at a flood and minimise the potential damage at the same time, the safety can be made maximal (RPB, 2007). 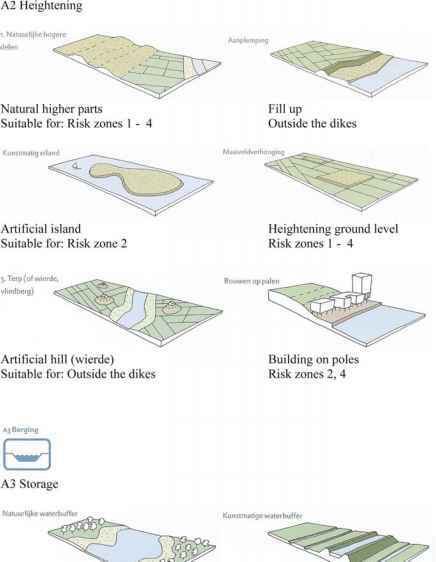 The supposition that every acre behind the dike is equally safe is not correct. 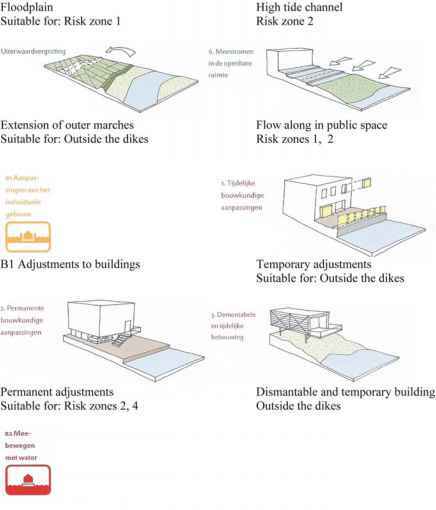 The depth of the ground level, related to the sea level indicates the safety of an area, while the distance from the dike and the appearance of obstacles are able to break the flood and are important for the safety as well. Safe and less safe parts emerge within one dike-ring. Not so deep areas, which are far from the dike with a lot of obstacles in between, are safer than deep areas close to the dike (Fig. 4.9). situations the measures are suitable. Depending the situation, a combination of suitable measures can be taken to optimise safety in a certain dike-ring (Fig. 4.10). 4. Increased popularity housing on or next to the water. Building the type of house should be matched with the type of water.